In the Origins of Totalitarianism, Hannah Arendt famously argued that the stateless were so rightless, that it was better to be a criminal who at least had some rights and protections. In this book, Kathleen R. Arnold examines Arendt’s comparison in the context of post-1996 U.S. criminal and immigration policies, arguing that the criminal-stateless binary is significant to contemporary politics and yet flawed. A key distinction made today is that immigrant detention is not imprisonment because it is a civil system. In turn, prisoners are still citizens in some respects but have relatively few rights since the legal underpinnings of "cruel and unusual" have shifted in recent times. The two systems – immigrant detention and the prison system – are also concretely related as they often house both populations and utilize the same techniques (such as administrative segregation). Arnold compellingly argues that prisoners are essentially made into foreigners in these spaces, while immigrants in detention are cast as outlaws. 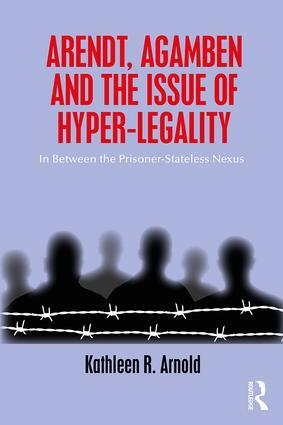 Examining legal theory, political theory and discussing specific cases to illustrate her claims, Arendt, Agamben and the Issue of Hyper-Legality operates on three levels to expose the degree to which prisoners’ rights have been suspended and how immigrant policy and detention cast foreigners as inherently criminal. Less talked about, the government in turn expands sovereign, discretionary power and secrecy at the expense of openness, transparency and democratic community. This book will be of interest to scholars and students of contemporary political theory, philosophy and law, immigration, and incarceration. 6. Conclusion: Is it Better to Be a Criminal Than a Stateless Person? Kathleen R. Arnold teaches political theory and immigration law at DePaul University. Her research interests are in statelessness, homelessness, and immigration. Professor Kathleen R. Arnold discusses the politics of immigration on Chicago’s local news TV program, Politics Tonight. Her interview can be found here. Immigration expert Kathleen Arnold discusses asylum for victims of domestic violence and the U.S. Supreme Court ruling on President Donald Trump’s travel ban.